Today’s children are not the same as the old days. We were children, we are parents, and know better that there are new different tasks that require much more. For all this, we must offer them the best possibilities such as good cognition and brain development. Our demanding daily lives require more mental agility and brain performance to help the brain and body to be awake and alert, but also we need to reduce the intellectual tiredness. Because the quality of life is as important as the increase of life expectancy. Intellectual work and physical work are 2 vital tasks that our body preform, intellectual work includes all activities that require thinking, focus, attention and studying while physical work requires muscles movements and includes daily tasks like walking, running and exercising. Cerebrum Range have customized innovations for all life stages that support both intellectual and physical work in addition to nutritive balance and development. To live an active lifestyle, it requires a lot of energy and dedication, supplying the body and brain with what they need is a very important step towards being active, specially for sports people and people who want to be more energetic. Long nights during work projects and exams can be very hard, specially if you run out of energy, but having a boost will help you carry on with more energy and focus. Today’s kids need a lot of attention and love, and also optimal nutrition, supplying their brains with the best nutrition is very important during their early stages of life. Cerebrum Family, is a premium innovative brand made by Natiris, using advanced facilities with GMP quality, and high purity from trusted sources ingredients to deliver the best quality in each product. 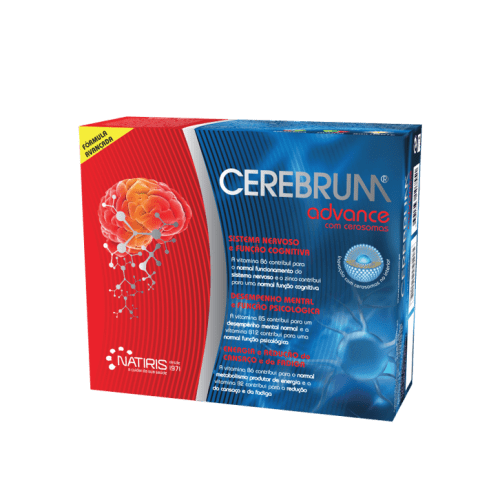 This makes Cerebrum Family an excellent solution for all life stages to support brain health and development as well as supporting neurotransmitter and providing nutritive substances to nourish the brain and nerves. Want to become a new member? Join us. Natiris is an innovative national and international company since 1971 located near Sintra, dedicated to health and wellness, which produces and markets food supplements according to Good Manufacturing Practices in the EU and USA.